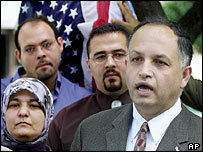 Almost 60% of Arab Muslims living in the US fear for the future of their families, according to a new report. Almost a quarter of those asked said a family member had been insulted because of their race or religion. Researchers at the University of Michigan questioned more than 1,500 people in the Detroit area over a six-month period. They found 49% of the general population would support the increased surveillance of Arab Americans. The conclusions bear out what several Arab and Muslim groups have been saying since the 9/11 attacks. According to the report's authors, Arab Americans are not cowering in their homes, but they do feel more scared than they did three years ago. Their feeling of vulnerability is made worse because they believe that some Americans do not respect their religion. Yet - surprisingly, perhaps - just like the population as a whole, they are willing to trade part of their civil liberties if it stops terrorism. Even so, over 40% of the general population would support the detention of Arabs and Muslims without the evidence to prosecute them.